Rarely available ranch-style floor plan in desirable Lowry. 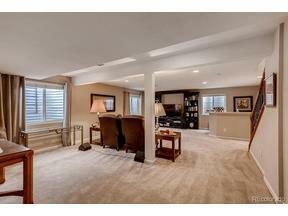 This beautifully maintained home with full finished basement will not disappoint. The open concept main floor features hardwoods throughout; a cooks kitchen with island, bar top seating, gas range/oven, tons of storage as well as eat-in space overlooking the deck and back yard; a formal dining room; guest bed and full bath; and family room with fireplace. The second main floor bedroom and bath and could easily double as an office or sitting room. The large finished basement has a huge game/rec area with wet bar for entertaining, a large bedroom, study/den, another full bath, and laundry room. The 2-car garage has built-in storage, and there's a sprinkler system for the yard. Lowry is a fantastic community with concerts, movie nights, and holiday events. It's easily walkable, has 10 parks across 22 acres, rec center, shopping/dining, and the acclaimed International School nearby. Don't wait, call to schedule your showing today!